World news? Maybe not, but one month from now Christie’s New York will auction off the rarest and most expensive Barbie doll with an estimate of $545,000. Mattel has asked the famed Australian jewellery designer, Stefano Canturi, to design a Barbie and create her ultimate accessories. He designed her a little black dress and a beautiful demi suite. The suite includes a ring and necklace with over three carats of white diamonds set in Canturi’s distinct cubism style: geometric lines in ditto or curved patterns. The necklace is highlighted by a pretty one carat bright pink square-cut diamond from the Australian Argyle mine. Just imagine this set life-size! Barbie will be auctioned at Christie’s “Magnificent Jewels” sale on October 20th 2010. Canturi & Mattel will donate 100 % of the profits to The Breast Cancer Research Foundation. Who’s bidding? 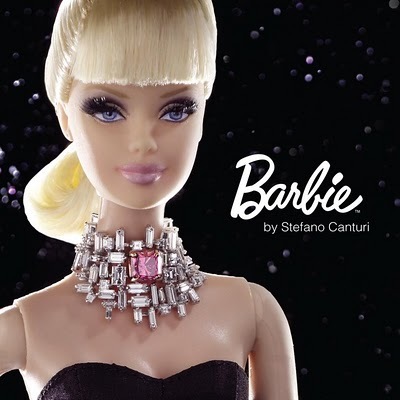 Below is Stefano Canturi with his Barbie. This entry was posted in Auctions, Contemporary Design, Diamonds, News & Trends and tagged Argyle mine, Barbie, Christie's, cubism, Mattel, Stefano Canturi. Bookmark the permalink. I’m not a Barbie Girl, but wouldn’t mind getting the diamond!